Center-pivot irrigation was invented in 1940 by farmer Frank Zybach, who lived in Strasburg, Colorado. It is recognized as an effective method to improve water distribution to fields. In 1952, Zybach went into business with A. E. Trowbridge, a friend from Columbus, Nebraska. Trowbridge put up $25,000 and got 49% of the patent rights. Zybach moved back from Colorado to Columbus, opened a shop, hired a few men, moved the height of the pipe up to six feet, and went into business. In the first two years of operation, they sold only 19 systems. The early designs were finicky and few farmers understood the systems. Zybach kept improving his designs and focused on making his machines better, rather than attempting to sell systems with problems. Zybach saw success with modified designs, which improved the systems operational efficiency. In 1954, he licensed his patent to Robert Daugherty and his company, Valley Manufacturing. Daugherty's engineers spent the next decade refining Zybach's innovation – making it sturdier, taller and more reliable – and converting it from a hydraulic power system to electric drive. Daugherty's company went on to grow into Valmont Industries, with its subsidiary Valley Irrigation continuing his vision for irrigation in the United States, eventually spanning the globe. To achieve uniform application, center pivots require an even emitter flow rate across the radius of the machine. Since the outer-most spans (or towers) travel farther in a given time period than the innermost spans, nozzle sizes are smallest at the inner spans and increase with distance from the pivot point. Aerial views show fields of circles created by the watery tracings of "quarter- or half-mile of the center-pivot irrigation pipe," created by center pivot irrigators which use "hundreds and sometimes thousands of gallons a minute." Center pivot irrigation at Irkhaya Farms in Al Rayyan, Qatar. Center-pivot irrigation uses less labor than many other surface irrigation methods, such as furrow irrigation. It also has lower labor costs than ground-irrigation techniques that require digging of channels. Also, center-pivot irrigation can reduce the amount of soil tillage. Therefore, it helps reduce water runoff and soil erosion that can occur with ground irrigation. Less tillage also encourages more organic materials and crop residue to decompose back into the soil. It also reduces soil compaction. 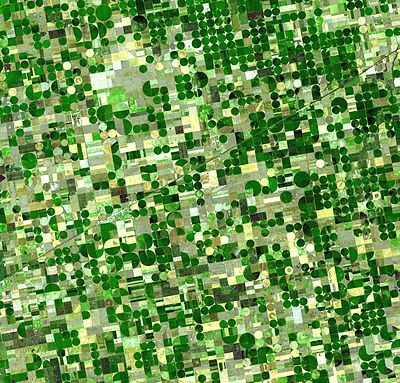 In parts of the United States, sixty years of the profitable business of intensive farming using huge center-pivot irrigators has emptied parts of the Ogallala Aquifer (also known as the High Plains Aquifer). One of the world's largest aquifers, it covers an area of approximately 174,000 mi² (450,000 km²) in portions of the eight states of South Dakota, Nebraska, Wyoming, Colorado, Kansas, Oklahoma, New Mexico, and Texas, beneath the Great Plains in the United States. In 1950, irrigated cropland covered 250,000 acres. With the use of center-pivot irrigation, nearly three million acres of land were irrigated in Kansas alone. At some places, during maximum extraction, the water table dropped more than five feet (1.5 m) per year. In extreme cases, wells had to be greatly deepened to reach the steadily falling water table. In some places in the Texas Panhandle, the water table has been drained (dewatered). "Vast stretches of Texas farmland lying over the aquifer no longer support irrigation. In west-central Kansas, up to a fifth of the irrigated farmland along a 100-mile (160 km) swath of the aquifer has already gone dry." It would take hundreds to thousands of years of rainfall to replace the groundwater in the dried up aquifer. In the 21st century, recognition of the significance of the High Plains Aquifer has led to increased coverage from regional and international journalists. A May 2013 New York Times article "Wells dry, fertile plains turn to dust" recounts the relentless decline of parts of the High Plains Aquifer System. ^ a b Mader, Shelli (May 25, 2010). "Center pivot irrigation revolutionizes agriculture". The Fence Post Magazine. Retrieved June 6, 2012. ^ ddr.nal.usda.gov Center pivot irrigation system modification to provide variable water application depths. ^ a b Gray, Ellen (May 3, 2012). "Texas crop circles from space". NASA. Retrieved June 6, 2012. ^ a b Morgan, Robert (1993). Water and the Land. Cathedral City, CA: Adams Publishing Corp. pp. 35–36. ISBN 0935030026. ^ Alfred, Randy (July 22, 2008). "July 22, 1952: Genuine Crop-Circle Maker Patented". Wired Magazine. Retrieved June 6, 2012. ^ a b c d e f g "Growing Rice Where it has Never Grown Before: A Missouri research program may help better feed an increasingly hungry world". College of Agriculture, Food and Natural Resources, University of Missouri. July 3, 2008. Retrieved June 6, 2012. ^ a b c d e f g Wines, Michael (19 May 2013). "Wells Dry, Fertile Plains Turn to Dust". The New York Times. ^ Evans, R.O. ; et al. (March 1997). "Center Pivot and Linear Move Irrigation System" (PDF). North Carolina Cooperative Extension Service, North Carolina State University. Retrieved June 6, 2012. ^ "Wheelmove Sprinkler Irrigation Operation and Management" (PDF). ^ Dennehy, K.F. (2000). "High Plains regional ground-water study: U.S. Geological Survey Fact Sheet FS-091-00". USGS. Archived from the original on 2008-07-23. Retrieved 2008-05-07. ^ Morris, John Miller (2003). Sherry L. Smith (ed.). The Future of the Southern Plains. Norman, Oklahoma: University of Oklahoma Press. p. 275. ISBN 0806137355. ^ Rainwater, Ken (1 January 2004). "Book Review: The Future of the Southern Plains". Great Plains Quarterly Great Plains Studies. Lincoln, Nebraska: Center for Great Plains Quarterly Great Plains Studies, University of Nebraska. Snyder, Cindy (January 18, 2011). "Center pivot irrigation systems cost big bucks". Times-News (Twin Falls, Idaho). Retrieved June 6, 2012. Becker, Hank (October 2, 2000). "Can Crop Temperature Guide Center-Pivot Irrigation?". USDA Agriculture Research Service. Retrieved June 6, 2012. Garner, Fay (February 2008). "Tuskegee Turf Farm Battles Drought With More Efficient Irrigation". USDA Natural Resources Conservation Service. Retrieved June 6, 2012. Boyd, Vicky (February 16, 2012). "Valley Irrigation unveils tire sensor for center-pivot systems". The Grower Magazine. Retrieved June 6, 2012. Wikimedia Commons has media related to Center pivot irrigation.